We’re building the most energy efficient house in the Valley but we also want the Jug Mountain Ranch Net Zero Home to be elegant and reflect our gorgeous mountain community. The exterior will be accented in wood trim featuring local Ponderosa pine and Douglas fir. Paired with our locally sourced wood trim, we have selected an Idaho field stone applied in a dry stack pattern for all the exterior stonework and pillars. This beautiful stone complements the wood and stucco exterior and gives this home an elegant and timeless appeal. 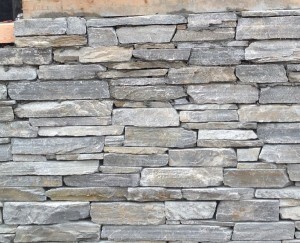 In keeping with our intent to use local materials and craftsman, we selected this gray and tan stone from Oakley, Idaho. A big tip of the hat to Baumgartner Masonry for their excellent stonework!